SQA Advanced Certificate and SQA Advanced Diploma qualifications provide practical skills and theoretical knowledge that meet the needs of employers. 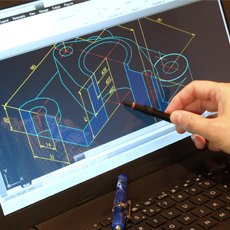 The SQA Advanced Certificate and SQA Advanced Diploma in Computer Aided Draughting and Design give learners the opportunity to develop the practical skills and underpinning knowledge of CAD, the design process and wider engineering technology. The SQA Advanced Certificate Computer Aided Draughting and Design (CADD) will develop a comprehensive level of knowledge and practical skills in traditional CADD topics, as well as the more advanced features of modern software. The candidate will also develop knowledge and understanding of the design process, and of how CADD can help in achieving a desirable design solution. The SQA Advanced Diploma Computer Aided Draughting and Design is designed to meet the demands of employment in engineering, construction and design related industries. It will provide candidates with a range of contemporary vocational skills including the preparation, co-ordination and communication of technical information (including drawings, graphical information, reports and schedules); contributing to meeting relevant statutory regulations and controlling projects by monitoring agreed standards; and obtaining, recording and organising information. Specific tasks covered in these qualifications include the use of a CAD system to produce 2-dimensional details and drawings, 3-dimensional part and assembly models, 3D animations, and technical illustrations. Other tasks that may be covered include the production of physical prototypes (produced by hand and 3D-printed), creation of hand-drawn sketches, using mathematics skills to solve design problems, and presenting final design solutions using traditional and technological processes. These qualifications are available through a growing number of colleges, training providers and universities around the world. Typically, an SQA Advanced Certificate takes one year to complete and an SQA Advanced Diploma takes two years. These qualifications provide progression routes to further study (see Progression). NC or SQA Advanced Certificate in a related discipline; these could include but are not limited to the NC Computer Aided Design and Technology, NC in an Engineering discipline, NC Built Environment, SQA Advanced Certificate in Mechanical Engineering, SQA Advanced Certificate in Manufacturing Engineering or SQA Advanced Certificate in Fabrication and Welding Engineering. Learners who achieve an SQA Advanced Certificate in Computer Aided Draughting and Design can progress to the SQA Advanced Diploma. The SQA Advanced Diploma Computer Aided Draughting and Design can provide progression to degree-level study. For further information please refer to SQA’s progression partners. Employment opportunities exist within the Engineering, Manufacturing and Construction sectors as CAD technicians and junior designers. Assessment support packs are available for the mandatory units within the SQA Advanced Certificate and SQA Advanced Diploma. Group award specification - GN0Y47 GM9V48.